Jack Horne is educated to double A-level standard in Information Technology (RSA Diploma) and currently works for the local theatre in Plymouth, England. A number of his poems, short stories and articles have been published in magazines, anthologies and webzines, and broadcast on radio programs. He has also had some competition success. Horror is his favorite genre. Jack Horne has collaborated with two friends to publish a collection of poetry: Shades of Darkness and Light, also available from eTreasures Publishing. Jack the Ripper expert, Shelly Kelly, has always dreamed of solving the famous Victorian crime. Down on her luck, despite being the respected author of numerous Ripper books, she applies for a guide job at Jack’s Ripper tours. When she enters the shabby premises and meets its owner, Andrew Windblower, she never dreams it will lead her back into the past, into Victorian England. As the serial killer begins his blood-thirsty career, Shelly knows she has to pit her wits against him to save innocent lives. But will she be the one to finally beat the murderer, and how can she ever return to modern day London? LOVING, LIVING & LEGENDS is Jack Horne’s solo effort sequel to Shades of Darkness and Light, which he wrote with friends Carolyn Devonshire and Sandra Stefanowich (the book was published in 2013 by eTreasures). There should be something for everyone in this collection! Humour plays quite a large part, as Jack believes laughter is a vital part of living (and loving). Many of the poems were written straight from the heart. Jack’s intention is to cover subjects such as loneliness, loss, illness and death, with sensitivity and, where possible, hope. Faith and belief add to the message of hope. A number of these poems are about the unknown: mysteries of life or death, or the supernatural. Jack has always been fascinated with the unexplained and has researched the subject tirelessly. His imagination has also roamed, wild and free. As this collection focuses on positivity, rather than negativity, you won’t find any really scary pieces here. From Haiku to Limericks, you will find a variety of poetic forms. Some are humorous; some are sad. All have a deep meaning to the authors and, hopefully, to the readers. Shades of Darkness and Light will bring both smiles and tears. 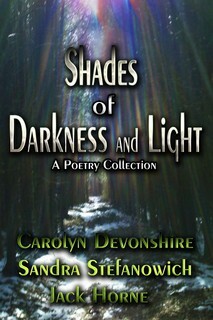 If you enjoy poetry, you'll find something for everyone to enjoy in this book.